World 8-6 is the sixth level of World 8 in Super Mario 3D Land. This level is at the beginning of the second area in World 8, and is modeled after a castle level. The player starts on a platform, and must cross three grate platforms that sink when touched. The next platform has a Dry Bones, as well as a round, grate-like object at the end of it; by standing on the other end, it begins rolling down toward the next platform. The end of the next platform is guarded by a Wallop, and there is a nut on a bolt; the player must stand in the direction the arrows are facing so that it heads toward a Warp Box; however, as soon as Mario steps on it, a Magikoopa appears. The Warp Box takes Mario to the area with the Checkpoint Flag on it. On the lower part of the platform are a Dry Bones and another Wallop. The player must then take another angular object that rolls depending on the side the player is on; on the next platform is a Dry Bones and a Draglet, with another cylindrical grate afterward. 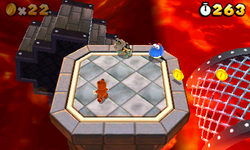 As the player advances, there are several lava geysers opposing him or her. The next area is another bolt that rises if the player runs in the direction of the arrows. The next platform is another platform that rotates with the player's weight. Two Magikoopas spawn as soon as the player reaches the middle, and a Warp Box is at the end, on the interior of the platform. This Warp Box leads the player to another cylindrical mesh, which takes him or her to the platform with the Flagpole. Star Medal 1: Near the beginning of the level, there is a large nut and a bolt. The player should turn the nut counterclockwise (rotate it to the south) to be able to reach the first Star Medal. Star Medal 2: While rolling across the lava on the cylindrical mesh, the player should see a + Clock near a sinking platform. If the player stands on the sinking platform, they can grab the second Star Medal. Star Medal 3: The third Star Medal is found at the end, right above the Warp Block. The player needs to move along the platform to move it, so the medal can be reached.